As a parent, you want to do the most for your child. You want to ensure that if a problem arises in their development, you will make the swiftest and safest action to remedy the situation. When a child is born with vision impairments, there are two courses of action: surgery or therapy. As a parent of a child with vision difficulties, such as lazy-eye, doubled vision, or crossed eyes, you want to immediately treat the problem. The younger a child is, the easier it is to rectify any vision deficiencies. Though there are two options for treatment of vision problems, both may not be available to all. Surgery can be dangerous for younger children, and the procedure might be too expensive for parents. Vision therapy, however, is a safe and easy way to build strength in your child’s eyes and correct many vision impairments. This “strength” does not refer to the eye muscles, but to the neurological pathways from the eyes to the brain. Vision therapy is conducted by an optometrist that uses exercises and images to help patients strengthen the eyes and brain — which is essential for excellent vision. In each session, a patient is faced with computerized visual activities, prisms, and ocular filters to help with eyesight. Vision therapy exercises can do more than just help with eye problems. Vision therapy can also help with oculomotor control, coordination, and learning disabilities. Vision is the dominant tool in learning. Without it, children have increased difficulty in processing and visualizing information. Vision means a lot more than eyesight. The common mistake among parents is the belief that if their child has passed an eye screening, they do not have eye-brain difficulty; this is false. Your child may have passed a visual eye exam, but problems along the eye-brain pathways may still be present. For example, if your child reads a sentence, then forgets where they left off, this might be an example of where their neurological pathway to their brain has been underdeveloped. Luckily, there is a way to strengthen this pathway and save your child years of struggling in school. By using vision therapy sessions, your child can learn to focus on certain objects and words to maintain eye-brain health. Vision is extremely important in a child’s development. Much of what they see on a day-to-day basis is used and interpreted for learning purposes. If their vision is somehow impaired as a child, this could lead to huge amounts of struggle later on in their lives. By enrolling your child in vision therapy while they are young, you can resolve the problem before it begins to affects their opportunities in life. It has been found that 80 percent of what a child learns in the classroom is captured by their eyes. If your child currently has any learning/reading problems, consider an evaluation with Dr. Deviney to see if vision therapy may be helpful. Therapy has been proven to work and has shown considerable difference in younger patients. The longer you wait to correct vision impairments in your child, the more difficult the effects will be able to fix. 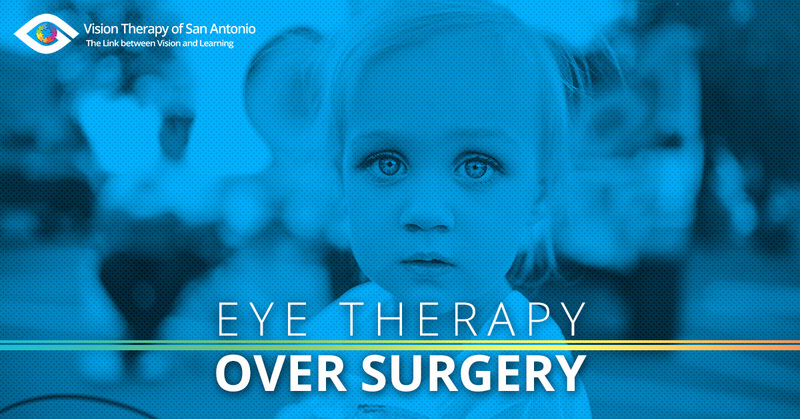 If treating your child’s vision and learning disabilities is something that would interest you, visit Vision Therapy of San Antonio. By using proven techniques and practices, we can help your child gain strength in their vision.